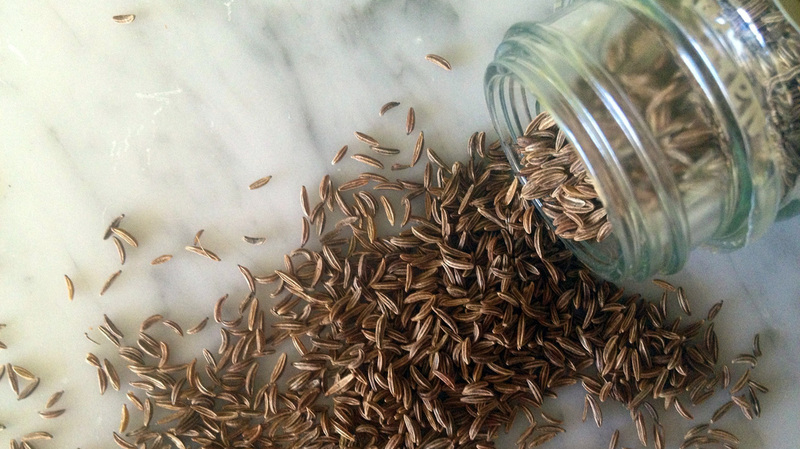 Kitchen Window: The Caraway Seed Is A Spice Worth Meeting Whether it belongs in the rye bread or the sauerkraut is sometimes hotly debated. But food writer Domenica Marchetti says caraway's complex flavors can tone down the richness of meat dishes, or bring cabbage and potatoes to life. Get recipes for Whole-Wheat Fettuccine With Savoy Cabbage, Cream And Caraway Seeds, Heartland Brisket and James Beard's Seed Cake. I've always thought caraway to be an underappreciated spice. It holds none of the historical significance of cinnamon, cloves, pepper or other prized spices that for centuries drove commerce among Asia, Africa and Europe (and that ultimately led to the discovery of the Americas). In flavor, it lacks the Mediterranean perfume of its cousin fennel or the allure of cumin, another close relative. Its aroma is sharp and slightly aggressive, and if you bite into a seed on its own, there is, at first, a certain soapiness to its flavor. But beneath the surface, there is complexity to this sturdy spice. It's peppery and earthy, and even a little citrusy. I can't imagine a good pastrami on rye without it. Or a decent pumpernickel roll. It cuts through the richness of meat dishes and gives character to cabbage. Beneath the surface, there is complexity to this sturdy spice. It's peppery and earthy, and even a little citrusy. I can't imagine a good pastrami on rye without it. Caraway is the key ingredient in aquavit, a Scandinavian spirit flavored with spices and citrus peel; and kummel, a sweet liqueur originally distilled in Holland but now primarily produced in Russia. There's even a bit of lore mixed in. In medieval times, it was thought to keep lovers interested in one another. But it doesn't inspire thoughts of romance in everyone. "It was a cheap peasant spice," says culinary historian Michael Krondl, author of Around the American Table: Treasured Recipes and Food Traditions from the American Cookery Collection of the New York Public Library. "I have a German cookbook from the 18th century in which it shows up no fewer than 35 times," he says. Krondl, who is of German heritage, says caraway was ever-present in the dishes of his childhood. "My parents would put it on potatoes, duck, pork, soups. I grew up with the stuff, and I hated it." Patty Erd, longtime spice merchant and owner of The Spice House, also has lukewarm memories of it. "I never cared for caraway in bread, and did not like rye bread at all," says Erd. "I just skipped the bread that was part of our daily dinner." The grandmother of Erd's husband, Tom, had a New Year's Eve tradition of boiling shrimp in water flavored only with caraway. "A select few of us felt that was a great waste of shrimp," Erd says. And for years, when The Spice House's flagship store in Milwaukee hosted its annual Riversplash Festival, local business leaders bitterly debated whether to add caraway to the sauerkraut that accompanied the bratwurst that were served. "People really felt strongly about it," Erd recalls. Domenica Marchetti is the author of five books on Italian cooking, including The Glorious Pasta of Italy and, forthcoming this fall, The Glorious Vegetables of Italy. She is the co-founder of American Food Roots, a new website that explores why we eat what we eat. She also blogs about Italian home cooking at www.domenicacooks.com. In caraway's defense (she is a spice merchant after all), Erd says the spice's history, if not illustrious, is noteworthy. "It seems caraway was Europe's oldest condiment," she says. Evidence found in lake dwellings in Switzerland suggests it dates back at least 5,000 years. The Romans get credit for spreading the seeds throughout Europe in their conquering travels, and it was cultivated in Europe from Sicily to Scandinavia since the Middle Ages. Early uses for caraway were medicinal, Erd says. References found in German medical books dating back to the 12th century cite it as a stomach tonic as well as a remedy for flatulence and colic. In the kitchen, caraway's role extends well beyond rye bread or even German food. It is a member of the family that also includes carrots, dill, fennel and parsley. It has long been prominent in Scandinavian and Eastern European cooking, and also is found in the cuisine of North Africa, most notably in harissa, the hot chili paste used to flavor soups, couscous, stews and other recipes. In baking, caraway turns up in biscuits and cakes, including some versions of Irish soda bread and British seed cake, where it is folded into the poundcake-like batter. It may be that my own fondness for caraway stems from the fact that it did not figure into my Italian mother's cooking. Mostly I enjoyed it in the overstuffed pastrami on rye sandwiches I ordered at Carnegie Deli on family day trips into New York City. I find myself cooking with caraway often this time of year, when March's winds can seem more unforgiving than the snow and ice of January or February. I like its sharp flavor, its slightly bitter finish, and the way it brings to life otherwise bland foods like potatoes and cabbage. 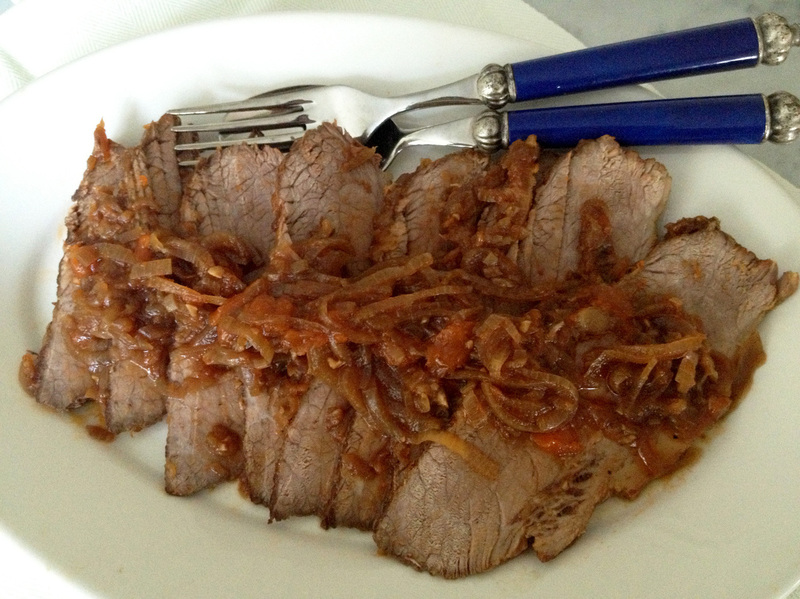 One of my favorite recipes featuring caraway is a dish called heartland brisket, which is every bit as comforting as it sounds. 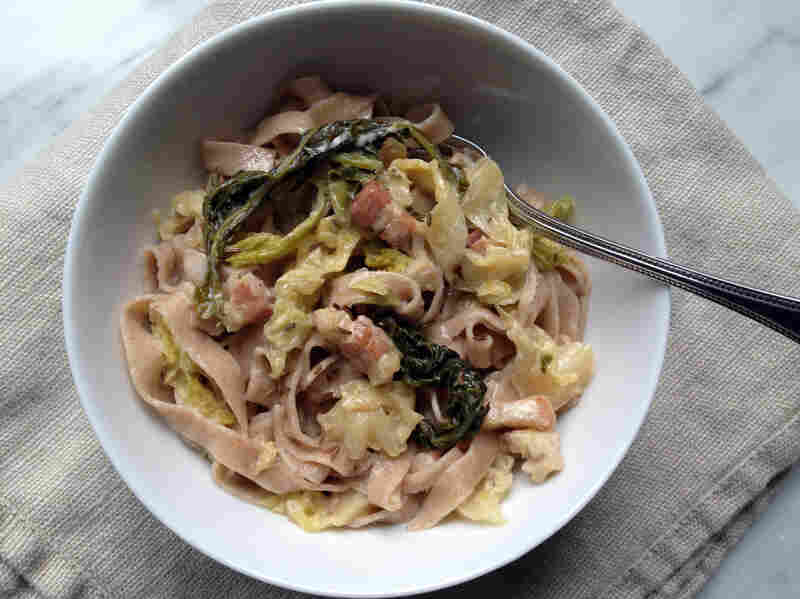 And, somewhat unconventionally, I use caraway as the primary seasoning in my recipe for whole-wheat fettuccine tossed with cabbage, cream and pancetta. 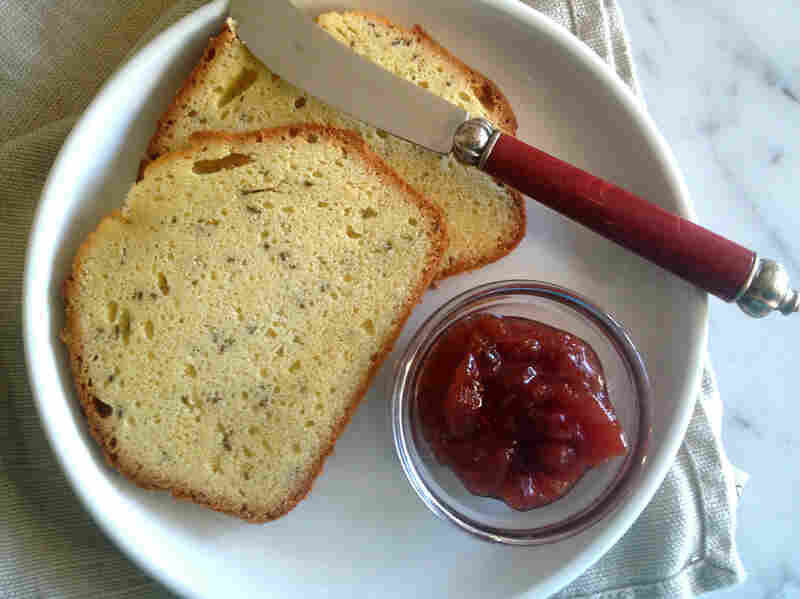 On the sweet side, the aforementioned British seed cake is easy to make and serves as a satisfying late-winter afternoon snack, spread with a little fig jam and accompanied by a cup of hot tea. I say it's time to put the romance back in caraway. Who knows? Maybe it will repay in kind. My Italian mother did not cook with caraway seeds, and you might think this assertive spice would be out of place in an Italian pasta dish. In fact, it pairs beautifully with braised savoy cabbage and earthy whole-wheat pasta. When I'm feeling ambitious I make my own whole-wheat fettuccine. But when I want to keep things simple I use boxed dried pasta. This recipe is from my book The Glorious Pasta of Italy (Chronicle Books, 2011). Warm the olive oil in a large saute pan over medium heat. Add the pancetta, stir to coat with the oil and saute for 5 to 7 minutes, or until the pancetta is sizzling and has begun to render its fat and is just starting to crisp. Stir in the shallot, caraway seeds and a generous grinding of pepper. Saute for about 5 minutes, or until the shallot is translucent and softened. Add as much cabbage as will fit in the pan. Pour 1/4 cup of the broth over the cabbage and cover. Let the cabbage cook for a few minutes, until it has started to wilt. Add more cabbage and a splash more broth. Cover and let cook until wilted. Continue until you have added the last of the cabbage and broth. Cook, stirring from time to time, for about 15 minutes, or until the cabbage is just tender but still slightly crunchy. Taste and adjust the seasoning with salt if you like. Stir in the cream, raise the heat to medium-high and bring to a boil. Reduce the heat to medium-low and simmer for no more than 10 minutes, until the sauce is slightly thickened. While the sauce is cooking, bring a large pot of water to a rolling boil and salt generously. Add the pasta and cook, according to the manufacturer's instructions, until al dente (if you're using fresh pasta, it will be done in under 5 minutes). Drain the pasta in a colander set in the sink and reserve about 1 cup of the cooking water. Transfer the pasta to the saute pan and turn the heat to the lowest possible setting. Toss gently to combine the pasta and sauce thoroughly, adding a splash or two of the reserved cooking water if necessary to loosen the sauce. Transfer the dressed pasta to a warmed serving bowl or shallow individual bowls. Sprinkle a little of the Parmigiano over the top and serve immediately. Pass the remaining cheese at the table. This robust braise of beef is one of those hands-off dishes that more or less cooks itself. All you need is a simple green salad on the side. And it comes with a bonus: The brisket tastes even better warmed in its sauce the next day. Shred the meat and pile it onto a bun. Although the recipe calls for using brisket that has been rolled and tied, I often skip that step and just cook the brisket as is. This recipe is from Savoring the Seasons of the Northern Heartland by Beth Dooley and Lucia Watson (University of Minnesota Press, 1994). In a large, flameproof casserole or roasting pan, brown the meat on all sides in the fat, 3 to 4 minutes per side. Remove the meat and set aside. Saute the onions and garlic until very soft and light brown, 20 to 30 minutes. Add the broth and stir, making sure to scrape up any browned bits on the bottom of the pan. Add the remaining ingredients except the caraway seeds and pepper and stir. Return the meat to the pan, cover and place in the oven. Braise the meat 2 1/2 to 3 hours, basting occasionally with the sauce and spreading some of the onions on top. During the last 30 minutes or so of cooking, sprinkle the top with the caraway seeds and pepper. To serve, slice the meat and spoon the sauce on top. "No tea table, in my opinion, is complete without a good seed cake," wrote James Beard in his memoir, Delights and Prejudices. Recipes for this traditional British cake date back to the 1500s, with some versions containing yeast and others resembling poundcake. Beard's version is the latter type, a simple cake of butter, flour, eggs, sugar and a little leavening, plus the caraway seeds. Somehow, the baking tames the flavor of the seeds. They add character to the cake without taking over. I've found that this cake is especially good toasted and topped with a dollop of fig jam. This recipe is adapted from Delights and Prejudices by James Beard (Atheneum, 1964). Butter and flour an 8-inch loaf pan and set aside. Heat the oven to 350 degrees. In the bowl of a stand mixer, using the whisk attachment, cream the butter with the sugar until light and fluffy. Add the eggs, one at a time, mixing after each addition. Beat in the vanilla extract. Whisk together the flour, baking powder, salt and caraway seeds. Gradually add the dry ingredients to the butter and egg mixture, beating until well incorporated. Pour the batter into the prepared pan. Bake for 1 hour, or until golden on top and a cake tester inserted in the center comes out clean. Set the pan on a cooling rack and let cool for 30 minutes. Remove the cake from the pan and let cool to room temperature before serving.